Type AF Air Filters - Airsan Corp.
Airsan Type AF filters are an economical choice for a wide range of industrial and commercial medium-duty applications. They include petrochemical industries, refineries, the paper packaging industry, and as a permanent filter option for rooftop HVAC systems. These filters feature low initial resistance, high dust-holding capacity and a low rate of increase in static pressure to provide peak filtration performance. Built to last, the filters have multiple layers of specially arranged, crimped, electro-galvanized expanded metal and assembled in durable 18-gauge galvanized steel frames. In addition to standard 1” and 2” nominal widths, Airsan can custom-create specialized sizes in aluminum, bronze or stainless steel to meet unique specifications. AIRSAN TYPE AF FILTERS ARE AN EFFICIENT YET ECONOMICAL CHOICE FOR A WIDE RANGE OF INDUSTRIAL AND COMMERCIAL MEDIUM-DUTY APPLICATIONS IN PETROCHEMICAL INDUSTRIES, REFINERIES, THE PAPER PACKAGING INDUSTRY, AND AS A PERMANENT FILTER OPTION FOR ROOFTOP HVAC SYSTEMS. TYPE AF FILTERS FEATURE LOW INITIAL RESISTANCE, HIGH DUST-HOLDING CAPACITY AND A LOW RATE OF INCREASE IN STATIC PRESSURE TO PROVIDE PEAK FILTRATION PERFORMANCE. 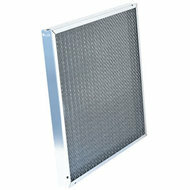 AIRSAN TYPE AF FILTERS ARE BUILT TO LAST WITH MULTIPLE LAYERS OF SPECIALLY ARRANGED CRIMPED ELECTRO-GALVANIZED EXPANDED METAL AND ASSEMBLED IN DURABLE 18-GAUGE GALVANIZED STEEL FRAMES. IN ADDITION TO STANDARD 1”AND 2” NOMINAL WIDTHS, AIRSAN CAN CUSTOM CREATE SPECIALIZED SIZES IN ALUMINUM, BRONZE OR STAINLESS STEEL TO MEET UNIQUE SPECIFICATIONS.